Looks like the neighborhood is becoming a hot spot for young writers -- there are two recent articles on different groups teaching youth to write plays. One group, reported in the Post, about Young Playwrights' Theater where kids write plays. There's also one on WAMU (scroll down) called Paso Nuevo, or "New Step." They have a play called La Catorce (which means 14) about 14th Street that is this Sunday at the GALA Theater. Pretty cool to see this sort of thing taking off! 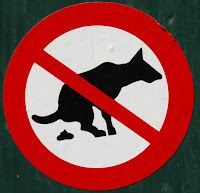 So here's a pet peeve I've heard a few times: during the blizzard's aftermath, you may have noticed a lot of dog poop that people chose not to pick up on top of the snow or frozen, unshoveled sidewalks. Well, now that the snow is mostly melted, that poop is down on the sidewalks, and it's all over the place. Pretty disgusting. I hope people will pick up their dog's poop, no matter what kind of weather it is. Just because it's cold out and the poop freezes, it doesn't mean it will remain that way. Plus that out-of-the-way place your dog pooped might actually be on the sidewalk when the snow thaws. And it's no fun at all to avoid both frozen snow and piles of dog poop. Vote for Columbia Heights in the City Paper's Best of D.C.
Just noticed that the City Paper is holding their annual Best of DC poll, so go ahead and vote for some of Columbia Heights' many businesses. I'll be voting for a bunch of them -- any faves you want to push? 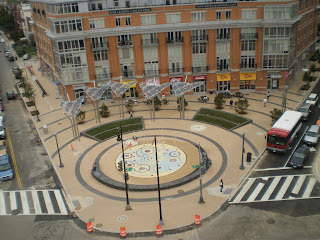 Columbia Heights Community Market opens June 5th! I missed the meeting on the Columbia Heights Community Market the other day, but I got an update from the organizers: they're going to have the market on Saturdays from 9 am to 2 pm, starting June 5. It looks like Saturdays had the majority on the recent survey the organizers held, and most producers (farmers, etc) preferred Saturday. Of course, there's also the Mount Pleasant and U Street markets on Saturday, so I hope that doesn't make it tougher. The market will run through October 30th at the Columbia Heights Civic Plaza -- the triangle pictured here bounded by 14th, Park and Kenyon. They'll accept WIC and food stamps, plus there will be entrepreneurial opportunities for youth, cooking demonstrations, and dance performances from the Dance Institute of Washington, which is based in the neighborhood. There's a bit more at DC Food for All. I'm looking forward to it! Today the Washington Post wrote about artist Bryant K. Adams, who designed some stickers I noticed in the neighborhood a few months ago. 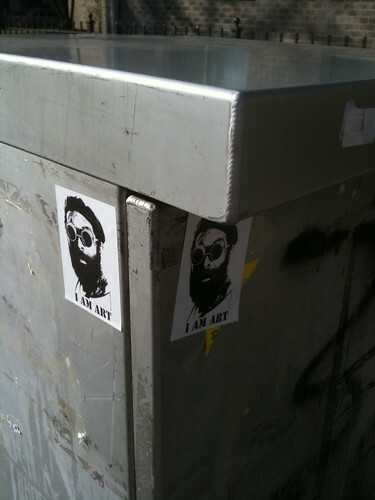 The stickers, pictured here, are on utility boxes and such around the town, causing some folks on this blog to debate whether it's art or litter. He also does sculpture and photography, including one piece at 14th and V.
It's an interesting article, and there's a photo gallery as well. And they mentioned my blog, which is pretty cool. Personally I like street art like this and interesting, artistic graffiti, but not the gang- or crew-related stuff. And then there's the posters for events that people stick to utility boxes and street poles, like the ANSWER Coalition. I'm not a fan of those, because they're up for months at a time, often well after the event has happened. Some people see them all as the same thing, but I think there's a difference. The other day I set up a New Columbia Heights Facebook page, so folks can follow the blog on there. There's already a NCH twitter (@newcolumbiahts), so you can follow us in lots of web 2.0 ways. No, this is not the new Dan Brown book. The folks at the Smithsonian forwarded me a fascinating story about an old iron coffin discovered during a recent renovation. The coffin held William Taylor White, a student who died in 1852. The museum worked to identify the boy, who was 15 years old and a student at Columbian College, where he was buried. Columbian College is now known as the George Washington University: until the 1870s, the college was located north of Florida Avenue between 14th and 15th Street, which was then called College Hill. Our neighborhood actually got its name from Columbian College, and there are still a few remnants around, like University Place between 15th and 16th and the various local streets named for colleges: Harvard and Kenyon for example, while Fairmont used to be called Yale and Girard was Princeton -- check out an old map showing that. DCist is reporting that the Department of Public Works will be collecting trash and recycling from your usual location on your usual day. Good news, as I know I have a ton of recycling just sitting and waiting to go out. There's a neat event coming up tomorrow, where Kojo Nnamdi of local NPR affiliate WAMU is hosting Kojo In Your Community, a forum on neighborhood issues which he'll also broadcast his show from. The event starts at 6:30 PM on Tuesday at All Souls Unitarian Church, 1500 Harvard Street NW. The topics for this discussion will include an hour long discussion on education reform and an hour long discussion on commercial development in Columbia Heights/Mount Pleasant. We are encouraging area residents to attend and be part of the show by asking questions, making comments, and sharing the view from their neighborhood with the wider WAMU 88.5 audience. In advance of this, I was on the Kojo Nnamdi Show a couple of weeks ago along with Tim from The 42 Bus, a nice Mount Pleasant blog. You can hear that segment here, although I think I misunderstood a few of the questions. Being on the radio is tough! 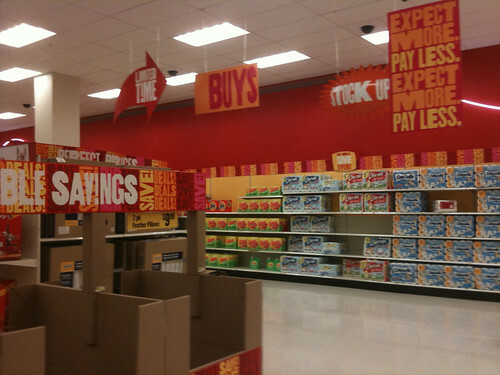 Just spotted this the other day: there's a new bulk items area at Target, for detergent, toilet paper and such. I thought it was kind of odd that they have signs saying things like "no membership required": who would think you need to join Target? If you like local history and beer, this is for you: this Saturday is the Columbia Heights Historical Drinkabout, a walking tour of the neighborhood with stops at local bars. The tour is guided by Brian Kraft, who is the historian for the Columbia Heights Heritage Trail that was unveiled a few months ago. It's $20 and goes from 2 pm to 5 pm -- email info@washingtonwalks.com for more info or to book. The tour is organized by Washington Walks. Recorded over three days in May 2008, all of the music on the album was created without any predetermined musical qualities, moods, or goals. To quote from the liner notes by flugelhornist and educator Ed Sarath: ?Transcending instrumental roles?where the saxophone sometimes upholds a rhythmic function and the guitar becomes a timbral vehicle ?the music at once embodies inward, contemplative qualities while not shying away from highly energetic excursions? Not often are artists able to sustain creative vitality while moving through diverse stylistic and structural regions?. Active members of the International Society for Improvised Music (ISIM), Gary and Kate have led their own ensembles at both the 2008 and 2009 events in Denver and Santa Cruz respectively. Kiernan McMullan will be opening, and several other BloomBars artists may perform as well. Artist Dion Jacob will be present as well improvising a painting along to the music. I know parking is hard these days with the big snowbanks everywhere, but please don't be that guy who tries to save the parking space in front of your house. I got an email from a reader complaining about a neighbor doing it, and I've noticed it a few places around the neighborhood -- people putting cones, lawn chairs, and buckets to block off parking spaces. 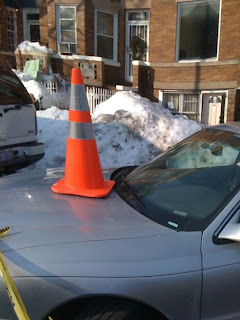 The reader included this photo -- someone moved a cone and parked there, then whoever saved the space (presumably) put the cone on the person's car. Looks like they might have added some caution tape too. Lame. MPD has said that you're not allowed to save spaces in that way, and any items placed in public space (i.e. in the street) should be moved. No space is your space, unless it's your driveway. Any suggestions for clearing alleys? Got this from a reader, it's a good question. Anybody have any suggestions or recommendations? Are you aware of any service to plow or remove snow from alleys in Columbia Heights? Ours is packed with snow, and I'm not sure there are any coordinated neighborhood efforts. I'm sure of people all gathered together, we could chip in $10 or so to pay a company to remove the snow - instead everyone's just shoveled their own paths, piling double the snow for those who may need to come by afterward. Do you have any thoughts? I was tempted to rent a Bobcat earthmover and do the work myself - but if everyone benefits, I'd like to see everyone contribute. Just wondering if you're aware of any social or community efforts to this (and it may have saved the person whose car caught on fire). 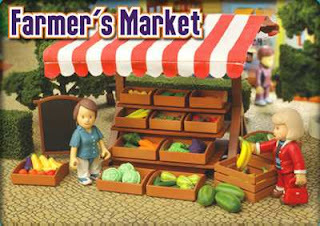 cover the latest developments in planning the market, including the results of a survey about the ideal days and times for the market and a report on feedback from potential farmers, bakers and other food producers interested in selling at the market. Sounds great! I'll definitely try and make it and report back. It will be at the offices of Change, Inc., which is at 1413 Park Rd NW. A lot of people seemed to want Sunday as the day, since there are already markets in Mt. Pleasant and U Street on Saturday. I'm interested to hear the results of the survey, which asked what sorts of other things people would like to see at the market. I wrote more about the market here, which will be located at the Columbia Heights Civic Plaza, the triangular area bordering 14th, Park and Kenyon. The South Columbia Heights Neighborhood Association/MPD PSA 304 and ANC 1B03 meeting is today at 7 pm at the The Josephine Butler Parks Center, 2437 15th Street NW. The head of DC's Department of Health, Dr. Pierre Vigilance, will be guest speaker. There's also a meeting on the planning for the renovation of the 11th and Monroe Street Park, which will be at the Columbia Heights Recreation Center (1480 Girard Street, NW) at 7 pm. The alleys remain impassable because about three feet of snow fell between Friday, February 5, and Wednesday, February 10, so DPW asks residents to put their trash in dark plastic bags and place them at the curb no earlier than 6:30 pm the night before collection and removed from public space by 8 pm on the day(s) of collection. Bulk collections scheduled for Tuesday, February 16, through Friday, February 19, will be rescheduled. DPW bulk collection drivers continue on snow duty. Ft. Totten: Ft. Totten Transfer Station, located at 4900 John F. McCormack Road, NE, will reopen to the public starting Saturday, February 13, to bring trash and bulk items. No recycling items will be accepted, nor will DPW provide Household Hazardous Waste/E-cycling/Document Shredding services Saturday, February 13. Ft. Totten is closed to the public on Presidents Day. Its normal operating hours are 1 pm to 5 pm weekdays and 8 am to 3 pm Saturdays, except holidays. Today is Mardi Gras, and this sounds pretty fun. Via DCist, the Red Derby will have zydeco music, $2 hurricanes, and masks and beads. A few friends recently have recommended Soul Vegetarian's Exodus, a vegan carryout at Georgia and Euclid, and it is tasty stuff. I tried the mac and cheese (made with fresh soy cheese) and it was pretty delicious -- it really seems like real cheese. The veggie burgers are good too: my buddy recommends the Garvey burger and the vegan steak and cheese. Another friend, who isn't even a vegetarian, says he's a fan of the veggie burgers as well. They also have some buffet style food, soul food like collared greens, and other items like tofu curry. Prices are reasonable: the Garvey burger, for example, is $5. My buddy recommended calling ahead and picking it up, as it can take awhile if you're getting it to go. The Post had a positive review last year, and here's their Yelp page. It's run by a religious group called the African Hebrew Israelites, who I am pretty sure are not the same people who stand at the Metro and yell. Soul Vegetarian Carryout is at 2606 Georgia Avenue NW, and their phone is 202-328-7685. They're open Monday through Saturday 11 a.m. to 9 p.m. and Sunday 11 a.m. to 3 p.m. Here's their website, though there's not much on it. The organizers of Columbia Heights Day, our neighborhood's annual festival, are holding a contest for this year's logo. You'd create a logo and submit it and if you win, it will be featured everywhere, including on t-shirts and posters. Last year some people (me included) were not fans of the "CoHi Day" logo they used, so put your artistic talents to work and make a good one. The contest runs from now until 9 pm on March 20. For more info or to submit designs, email donna@columbiaheightsday.org. 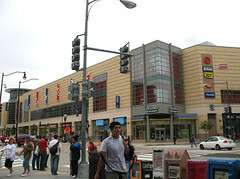 Also in Columbia Heights Day news, they have a new Twitter feed and Facebook page. Follow them and be a fan to get updates. This year's festival will be on August 28th. 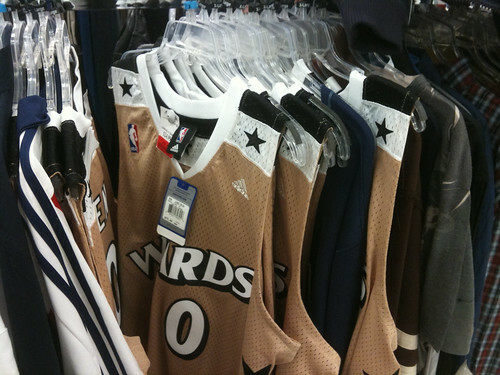 In case you want an ironic jersey or just love guns, Marshalls in DCUSA has gold Gilbert Arenas jerseys for only $15. Pretty funny. I was trying to back my car out of our driveway in the 3500 block of 11th St NW this evening and it got stuck in the snow, overheated, and caught on fire. It is out and no one was hurt, but the vehicle is destroyed. I have been in touch with the police, fire department, my insurer, and towing services, but due to the ice in the alley it has not been able to be moved yet. I just want to apologize to anyone who is inconvenienced. That stinks. Be careful if you're stuck, don't want that to happen to you. Previously I wrote about Activation 2719, an art show to be held in a newly renovated (and formerly abandoned) house at 13th and Girard. Due to the snow, they've moved the opening back to Feb. 20th from 6 to 11 pm. It sounds like a pretty cool show, with a number of DC artists and street artists, DJs, bands, and more, plus sponsorship from CommonWealth Gastropub and Dogfish Head Brewery. Here's more about it. You have to RSVP to go, so click here for that. If you already RSVPed for the postponed show, you're all set. Due to snowmaggedon, a lot of usual services have been delayed or canceled. Folks on the Columbia Heights Yahoo listserve say they haven't gotten any since Friday, though I did see US Mail trucks in Tenleytown yesterday, so maybe they're on the way. DPW says it will collect trash today, but not recycling, so that's something. There's been a lot said about plows, where they have and haven't gone, and the city has a website where you can track them yourself -- snowmap.dc.gov. It shows a time-series map of where the plows went and what they were doing at the time, which is pretty cool. It only shows today and yesterday, but still, gives you some idea. Looks like Fairmont Street and large portions of Columbia Heights north of Irving Street didn't have much attention (although maybe they're already clear, but I kind of doubt that for side streets). If you haven't been plowed or need some more, call 311. Back to work: how's your commute? Some folks were back to work yesterday, but it looks like almost everybody is back today. How was your commute today? As I noticed yesterday, the Metro was slow as molasses. Hopefully not today. Let me know in the comments how it went and if you have any suggestions to make it easier. A friend who's on the Sticky Fingers Facebook page passed this on: NBC Nightly News filmed a segment yesterday inside the bakery and also around Park Road. It was part of their Slice of Life segment where they talk about regular life, and this segment was on how people coped during the blizzard. I decided to take the Metro back from Tenleytown to see what would happen. In short, avoid it. Walking is probably faster. It took about 20 minutes for the train to show up at Tenleytown, then another 30 for it to get to Gallery Place, due to single-tracking along the way. Then about 15 minute wait at Gallery Place for the Green line, and then home. In all, it took about a hour and a half. The Circulator bus is running, however, which I should have taken from Woodley Park. I saw one show up at the Columbia Heights Metro. Might be a better option. If you've got some time around lunch, I'm going to be on WAMU's Kojo Nnamdi Show today around noon. They're going to broadcast a show from Columbia Heights sometime in the future, and as a precursor, they're talking to local bloggers, like myself and Tim from The 42 Bus blog. Take a listen! 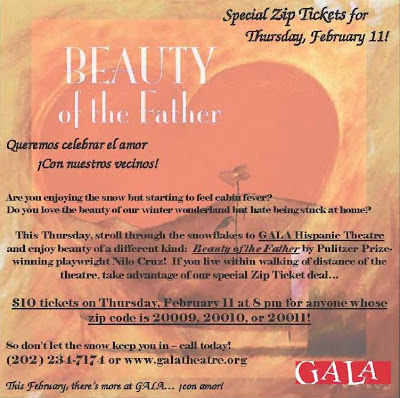 This is pretty neat -- GALA Hispanic Theatre at 14th and Park has a deal for $10 tickets to Thursday's performance of Beauty of the Father by Pulitzer Prize winner Nilo Cruz. Anybody who lives in the 20009, 20010, or 20011 zip codes gets the deal -- just show them something that proves it. Avoid cabin fever by checking out some theatre! The flyer is below. Don't worry about parking your car in the snow if you don't mind walking a bit: the city has extended free parking in the DCUSA garage to Saturday the 13th at noon. Is your street going to get plowed? ...We plan to get to every single street in the District. You should call 311 to make a service request (for a missed street or block) but a service request is not necessary to get your street plowed. We are dealing not only with a record breaking snow fall but with equipment being pushed to the limit because of a particularly snow-filled winter, which is unusual for DC. Mechanical problems have added an additional layer of complications. Did you have to work today? The Federal government is closed, and it looks like the main roads in the neighborhood are pretty clear. Parking, however, could be a pain, as you probably have to dig yourself out. Side streets also don't seem to be completely clear yet either, though I heard salt trucks going around at night. How was your commute? Easy, tough? Or work from home/watch DVDs? The Meridian Hill Park snowball fight was a lot of fun. The turnout was great, maybe 100-200 people, all gathered near the Joan of Arc statue. Folks split into two sides, one on the east and one on the west, and people would toss back and forth. Every now and then somebody would yell "charge!" or "attack!" and one group would run at the others, snow flying everywhere. People came up with some defenses, like sleds as shields. One guy wore a boogie board on his back and other people on his side would walk up behind him, then pop out and peg the other side. A few folks would fill up sleds with snow and toss the loads into the oncoming hordes. I brought along a horse head mask just in case nobody was throwing anything, and at one point I walked into no man's land wearing it and got pelted from all sides, which was pretty funny. The west side basically won, as they kept pushing the east siders back, though I think the west side had a lot more people. Then at some point, it sort of petered out and the fight changed directions: the two groups were facing north and south. A lot of photos were taken, like these from the City Paper and these from Flickr. Good times were had by all. Add your experiences or photos in the comments! Saw this earlier today. Lots more videos to come, including some of the Columbia Heights Snowball Fight, which had a great turnout. Have you filled out the Columbia Heights Community Market survey? With word that the Columbia Heights Community Market is making progress, it's worth taking a look at the survey the organizers have released. The answers will help them decide when and how to run the market, plus what to focus on. Take a look! There's even a Spanish version. Snowball fight at Meridian Hill Park on Saturday! Just got an email that a snowball fight is being organized for Meridian Hill Park Saturday at about 2 pm. Sounds like fun. The Meridian Hill Park stairs were also a great place to sled last time. As you might have noticed today, it was pretty treacherous walking in some areas of the neighborhood as unshoveled snow on the sidewalk froze and made a nice ice patch. The City Paper's Mike Debonis (aka Loose Lips) twittered the DC law about shoveling: "Per D.C. Code §9-601, you must shovel your sidewalk 'within the first 8 hours of daylight' after snow stops falling." If it helps, shoveling snow is great exercise. Good news: looks like the Columbia Heights farmers market is coming along very well! The other day I got in touch with ANC commissioner William Jordan, who's also helping to organize the market -- officially called the Columbia Heights Community Marketplace. Jordan and fellow organizer Brad Karrer responded to me with details. We are still designing the layout of the space, but we believe that we will be able to place at least six vendor tents, at least one community service provider tent and an entertainment area. We envision that our program will not simply be a farmer's market, but a meeting place for the community to come together. We intend to include local Columbia Heights businesses to participate by providing space for community service providers for outreach and programming as well as entertainment/event space for demonstrations and recitals. Nice to see this! I'm looking forward to it. No really, they exist! Just got a press release for the Ward 1 Republicans: they're having a meeting 7 pm today at the Booker T. Washington Charter School at 1346 Florida Avenue NW. Our goal is to organize our party to provide support for strong candidates in Ward 1. Our city has too long been dominated by a single party. Voters need a choice. They have a tough time ahead of them, as Jim Graham has already raised nearly $180,000, the most of any councilmember, and according to a recent press release, received 97.24% of the vote in the general election. Found: Orange & white cat with purple polka-dot collar. Pictured here. Call 202-744-1700 or come to 1413 Girard Street NW & ask at the front desk. DCUSA parking garage to be used by commuters? Interesting news from the Washington Business Journal, via DCist, that the DCUSA parking garage may soon be open to commuters, as sort of a park-and-ride lot. There's been a lot written about the garage, which usually is filled way below capacity and costs the city $100,000 a month to maintain. I sort of like this idea, in that at least the garage would get some use and the city would make some money back. Having the big garage in the first place was a dumb idea, as these retailers didn't seem to realize that this isn't your typical car-driven suburban shopping center. The article notes that 350 spaces would be available for monthly contracts and daily parking. It would cost $6 to park in the garage, and folks must be in by 9 and out by 7. However, there's also the possibility that it could make traffic in the area worse, although at least they'd mostly be outbound. That intersection is not fun during rush hour already (though maybe the streetscape improvements will help that). In case you were wanting to know what our DC councilmember was up to, check out Jim Graham's Twitter. He's posting a fair amount these days about legislation, DDOT, and some other issues. Other local pols are on Twitter too, including at-large councilmember Kwame Brown and South Columbia Heights Community Association president and ANC commissioner Sedrick Muhammad. Any other local politicians you're following? Are you ready for it? I really like this particular snowfall, everything was resting nicely on tree branches and such. Last night there was already a snowman (snowcat, technically) on 13th and Irving next to the Tubman School. 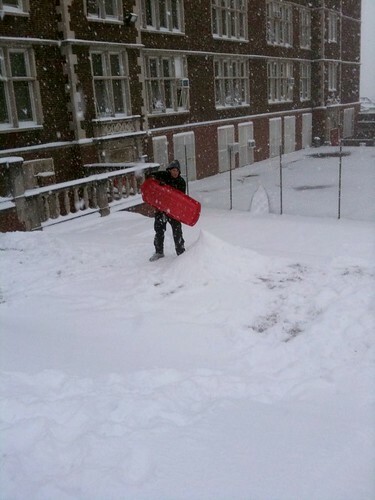 And if you're into sledding, I recommend Cardozo High School's terraces. If you're a fan of the show Lost, get yourself to Social tonight, they're having a luau-themed season premiere party in the basement bar. They're even having a strict no talking rule, except during commercials. Sounds fun/intense. It starts at 8, but you might want to get there early. Scary story from the Post, there was a big fire in an apartment building at 1512 Newton Street NW, leaving about 75 people without a place to stay. The building is without power, so the folks affected are staying at a temporary shelter. The article says the fire could have been related to code violations -- this just goes to show that if you think your place has unsafe conditions, go here and schedule an inspection or call the emergency inspection number. This sounds pretty cool -- the website readysetdc is holding an art show at a temporary gallery in a newly renovated house. The show, called Activation 2719 (after the address) is at the corner of 13th and Girard, and runs from Feb 6 - 20. The opening reception is this Saturday (the 6th) and you have to RSVP here. Artists include Tim “Con” Conlon, DECOY, James Walker, Emily Green Liddle, Bryan Rojsuontikul, Aniekan Udofia, Batool AlShomran, and No Kings Collective. There will also be bands and DJs. Activation 2719 is a rare opportunity for the artist to curate themselves, with themes that reflect their own personal style and background. Artist were asked to produce ‘site specific’ small collections of work to best be reflective of what makes their work both current and cutting edge. The range of works, genres, and mediums within Activation 2719 are as diverse as the artist themselves. These artists are contemporary in their niche while also pushing boundaries in art, both local and nationally. The common thread of these artists is their instantly recognizable use of intense color and topics within in their works, from the dynamic clean duct tape works and installations of artist Bryan Rojsuontikul to the graphic pen style and social commentary seen within the work of Aniekan Udofia. Activation 2719 promises to be unforgettable merger of style and character. The opening event will start at 6pm and will include a bar, food provided by Commonwealth Gastropub, and musical entertainment for the evening. Music on the 6th will be performed by DJ Fleg and also DJ Tom Lim, with a special vocal performance by Sheena Alexis and Bull Fight Academy. Additional sponsorship provided by Fathom Creative. Something that came up a few times on the What Is Columbia Heights Missing? post was child care. I know there are a lot of folks in the neighborhood with young kids, but I don't know of too many options for child care. There is an Easter Seals child development center at 13th and Girard, but I'm not sure if that's for any kids or only special needs kids. Otherwise, however, I don't know of much. Sticky Fingers has the new kids music event on every 1st and 3rd Wednesday, but that's all I've got. What do you think? Know of any good child care spots around the area? More snow: did you go sledding this weekend? As you all know, it snowed a fair amount this weekend, and it turns out it was pretty decent for sledding. We tried out the terraces at Cardozo High School for a couple hours on Saturday and had a good time. Along the way we were joined by a few random guys for a bit and found that the hill ended in a sidewalk, necessitating bailing out before you got to the bottom. 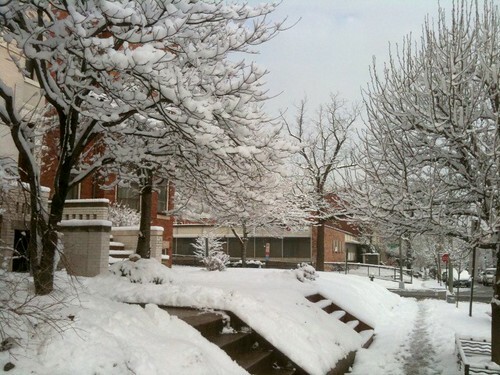 Anybody else have any neighborhood snow stories from the weekend?